All passengers are first class on this plane. 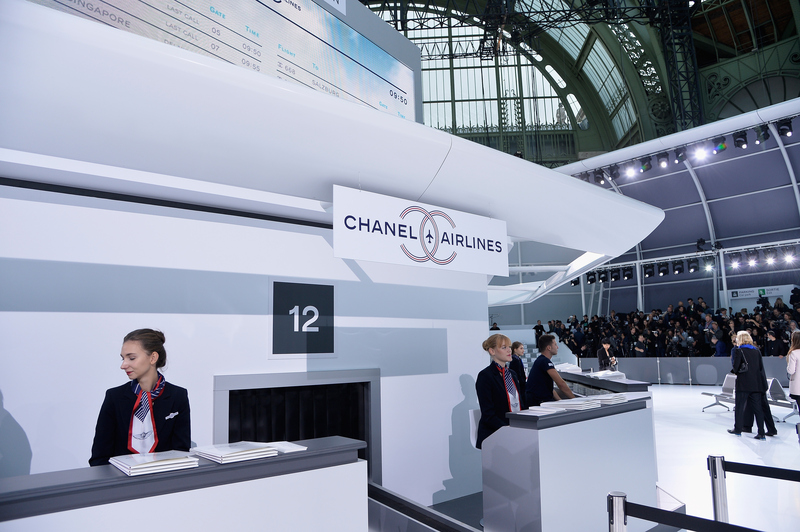 Chanel had an airport-themed runway at PFW, and while you may not be able to afford a ticket on that plane, you can definitely still dress the part of a fashionable flight attendant this Halloween. That’s right, folks, this ultra chic runway display is all sorts of costume inspo, because who doesn’t want to pretend to be a super stylish jet setter this October 31? From matching co-ords to wide-leg pants with lots of movement, the clothes Karl Lagerfeld sent down the runway would look amazing walking up and down the aisle in-between the rows of plane seating, or anywhere else for that matter. And with crew members like Kendall Jenner and Cara Delevingne controlling the air craft, why wouldn’t you want to go wherever they were taking you? In actuality that’d be one heck of an expensive plane ride, and if you can’t afford to wear Chanel, much less fly Chanel Airlines, you can still incorporate just enough fancy and flight attendant into your wardrobe. Halloween is the perfect excuse to try it out, although I wouldn’t be afraid to rock this all-year-round. See the looks from the Chanel show, and then see pieces you can mix and match to nail this look. Pants with movement was a theme throughout this show. This look is classic, but modern at the same time. Lagerfeld makes matchy-matchy look so good. Now, start styling a similar look for yourself. A tweed co-ord will help you achieve that old-school yet modern vibe. This structured jumpsuit will give you all of the chic flight-attendant status you need. A silk scarf will add a touch of elegance to your outfit. You can't get more classic than vintage white gloves. A hat or fascinator will add charm and interest to your flight attendant ensemble. How could you turn down the opportunity to wear adorable socks like these? Complete your Chanel costume with some super glam platform heels. You're well on your way to a fashionable take-off with these items.